The crisis in the countryside is much greater than a drought. And the water crisis in Marathwada, for instance, goes far beyond meteorological failure. Below are an extraordinary series of reports by Priyanka Kakodkar that have appeared in The Times of India between January and May 2015. This reporting links events, processes and policies in brief but incisive stories. They take us through the disaster facing the elderly, many of whom have been forced to return to work as a result of large-scale migrations. In a state where many destitute elderly persons have already seen deepened hunger due to the Central government’s savaging of the Annapurna Yojana. These 16 reports place in context the rise in farm suicides and the fall in crop yields and the bankrupting borewell mania in the rural regions. They take us to farmers in acute distress who are denied aid because of the ideological insistence on direct cash transfers - hurting countless cultivators who do not have bank accounts. They show us Kafkaesque official responses to everything from unseasonal rain to growing indebtedness. From Maharashtra’s build-and-forget irrigation projects to the glut in sugarcane driving a price crash. This exemplary series, combining field reports with research and data, brings us studies showing that the bulk of ‘agricultural credit’ is cornered by big agri-business and goes less and less to desperate small and marginal farmers. Report 1: The central government savages the Annapurna Yojana, leaving 80,000 elderly people hungry in the rich state of Maharashtra. Imagine the distress levels sparked off by this. 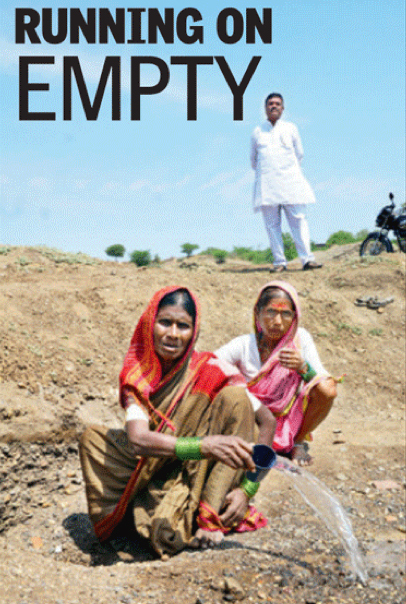 Report 2: The water crisis in Maharashtra now affects 90 lakh farmers, equal to almost the entire population of Sweden. Report 3: A huge drop in crop yields and the drought has impacted the arrival of supplies in the state’s main agricultural markets. Report 4: ‘State government’ figures -- from the revenue department mainly and not to be confused with (NCRB) figures that will show much higher numbers when they come -- show a 40 per cent rise in farm suicides. Report 5: Digging hours in the river bed for a pot of water. And doing anything else they can just for a few litres. The tanker economy is back in action. Report 6: With the able-bodied migrating in large numbers, 72-year-olds are returning to hard physical labour in Marathwada. Report 7: The borewell man: Vishwambar Jagtap has sunk 48 borewells in a desperate search for water. Now, he’s sunk, too. Report 8: How the ideological obsession with ‘direct cash transfers’ means lakhs affected farmers receive no compensation - because they have no bank accounts! Report 10: The bulk of farm loans do not go to farmers. As high a share of 44 per cent of ‘agricultural loans’ in Maharashtra are disbursed from urban and metropolitan branches of scheduled commercial banks than rural branches, which supply almost 30%. Report 11: The share of credit to small and marginal farmers has dropped dramatically across the country. The share of loans below Rs. 25,000, to marginal farmers, has sharply declined. Instead, loans of Rs 1 crore and above are driving the ‘revival’ of agricultural credit. You know who loans of that size would go to! Report 12: Maharashtra has nearly 70,000 small irrigation projects worth over 4,600 crore—but they are barely used. Only 12% of the irrigation potential they have generated so far is actually utilized, according to Maharashtra's Economic Survey for 2014-15. Report 13: As many as 601 farmers have killed themselves in Maharashtra in the three-month span between January and March this year. This works out to a chilling statistic of almost seven farmer suicides every day, according to the state government's own figures. Report 14: The government of Maharashtra now claims only three farmers killed themselves on account of distress arising from unseasonal rains. Report 15: The Maharashtra government defends its “only-three-farmers” claim: only three of them wrote suicide notes blaming unseasonal rains. Report 16: Two months after its ban on beef, the government of Maharashtra has not set up a single cattle shelter. That brings further pressure on already embattled farmers in no position to retain or care for their livestock.